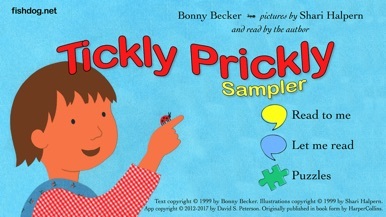 This is a free preview edition of award-winning author Bonny Becker and artist Shari Halpern's interactive picture book Tickly Prickly for children ages 1 to 4. Bonny and Shari have created a book of wiggly animals and bugs to tickle your child. 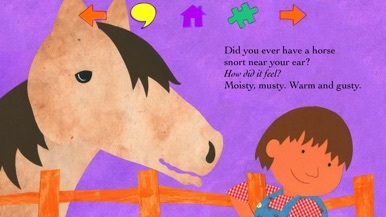 The gentle, rhythmic text, read by the author, appeals to a toddler's ear. The brightly-colored artwork, created with paper, cloth and paint, encourages children to touch. 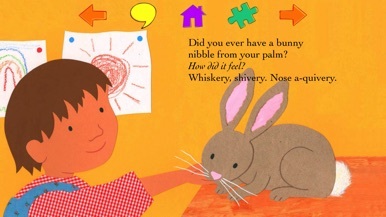 "Did you ever have a bunny nibble from your palm? How did it feel? Whiskery, shivery. Nose a-quivery." Every story page has animals in motion. Touching the animal restarts the motion. 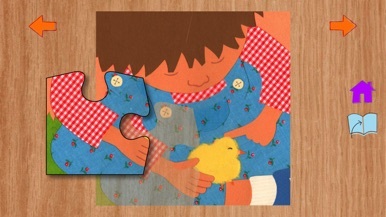 Tapping the puzzle piece, children can solve 4-piece jigsaw puzzles based on the current page. Pages can be read by the author with word highlighting, or an adult or older child can read the text to the child. Pages are turned by swiping across the page or by tapping orange arrows. Shari Halpern studied illustration at the Rhode Island School of Design and is the illustrator of many books for young readers, including "Hush, Little Baby" and the "I Love" series written by Philemon Sturges. Shari lives in New Jersey with her husband, a puppet maker, and three children.